Home » life » The woman took a photo and then went home. When she looked at it closely, she realized that she had narrowly escaped death! The woman took a photo and then went home. When she looked at it closely, she realized that she had narrowly escaped death! Julia Sundukova is a 37-year-old photographer from Russia. She loves to visit exotic locations and capture their beauty in pictures. But when Julia arrived home after a trip to Andasibe-Mantadia National Park in eastern Madagascar and began editing her photos, she noticed something that sent a chill down her spine. "I was exploring the area around the cabin and found a large lake surrounded by a rain forest," she remembers. What she didn't know at the time is that, while she was at that lake, she was being closely watched by one of the most deadly carnivores in the world. Hidden in the tall grass at the water's edge was a massive crocodile that had managed to sneak up to within a few feet of the young photographer. Julia only noticed this detail in the photo at home and was able to breathe a sigh of relief at her luck. If things had gone differently, she could have ended up as the crocodile's lunch! The Madagascar crocodile is a subspecies of the Nile crocodile and can grow up to 15 feet long and weigh over 2000 pounds! Nile crocodiles are believed to be responsible for more human deaths in Africa than all other species of crocodiles combined. Some experts estimate that they kill several hundred people each year. In Madagascar, crocodiles are the only animals that actually present a real danger to humans. "Crocodiles can remain completely still for very long periods of time, that's why they often go unnoticed," explained Julia, knowing just how lucky she was not to have stumbled over the one that had been watching her. 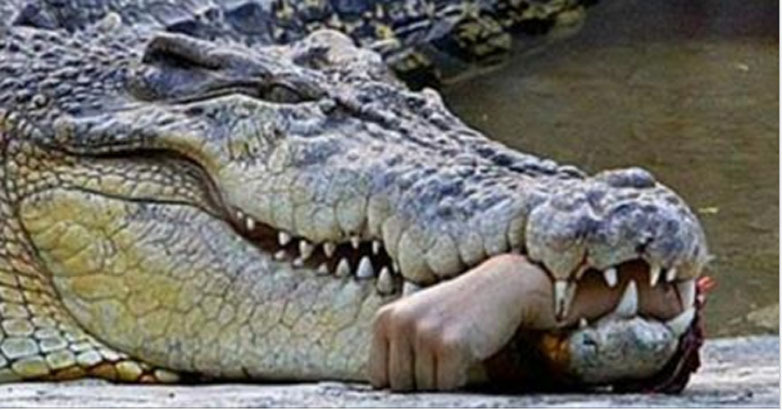 Maybe the crocodile just wasn't hungry. Or maybe Julia left just in time. Whatever the case, she'll always remember to take a much closer look the next time she finds herself in a region that these deadly beasts call home.